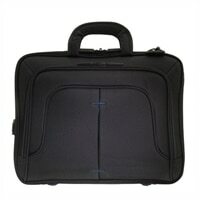 ECO STYLE Tech Pro TopLoad Laptop Carrying Case - 16.1-inch - Black, BlueTech Pro’s sophisticated and lightweight design will accommodate laptops up to 16.1”. Dedicated tablet/iPad compartment, No need to remove laptop/iPad/tablet as checkpoint friendly feature meets TSA requirements and allows for a quick & easy x-ray scan.Zipdown front workstation includes: key fob, business card holder, pen/pencil holders plus 3 pockets for additional accessories. Tech Pro's sophisticated and lightweight design will accommodate laptops up to 16.1"
Tech Pro’s sophisticated and lightweight design will accommodate laptops up to 16.1”. Dedicated tablet/iPad compartment, No need to remove laptop/iPad/tablet as checkpoint friendly feature meets TSA requirements and allows for a quick & easy x-ray scan.Zipdown front workstation includes: key fob, business card holder, pen/pencil holders plus 3 pockets for additional accessories.